The Cultural Center of the Philippines brings back the Performatura: Performance Literature Festival on April 5 to 7. Free and open to public, it is a three-day event that will feature performances, poetry readings, literature classes, art talks, chanters from the regions, slam poetry contest, film screenings, book fair, art exhibit, and interviews with renowned writers at various venues in CCP. Performatura: Performance Literature Festival is a three-day event happening this summer at the CCP. True to the CCP’s mission of bringing our country’s diverse traditions for the common Filipino to experience, entrance to the festival will be practically free. However, everyone is encouraged to donate a book which will serve as admission ticket. One book is equal to a whole day admission. Collected donations will go to the CCP’s partner libraries. 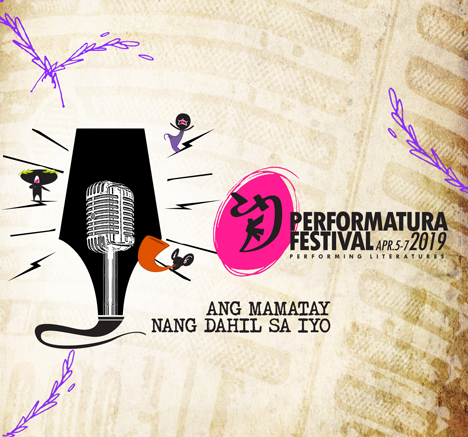 Performatura 2019 is the CCP’s way of highlighting the rich tapestry of Philippine artistic traditions that leap beyond the written word while welcoming writers and performers from diverse communities of the country. Performatura 2019 is a performance literature festival celebrating the intersections of the written word and performance. The word Performatura is a mash up of the word performance and orature or oral literature. Orature is a term coined by Ugandan linguist Pio Zirimu who wanted to raise oral literature to the level of written literature. The festival’s director is poet and performer Dr. Vim Nadera, Jr. The theme “Ang Mamatay Nang Dahil Sa Iyo” is an attempt to tackle the issue of changing the last line of Philippine National Anthem through literature and performances. The theme also alludes to issues that are relevant and being discussed in our society today. The first day of the Performatura is dedicated to literature in general and spoken word performances. Slam poets will have a battle of words in the first ever Performatura Slam Poetry Contest; Resil Mojares will be having one of his first interviews after receiving the National Artist for Literature Award last year; Dumagats from MAUBAN, Quezon Province will stage the epic of Gat Uban; and the audience will witness the launching of the official website of Huseng Batute, the first king of balagtasan. At 12:00 noon, the literary group Kuwit of the Philippine High School for the Arts will lead a set of literary performances such as storytelling for children. The second day of the Performatura is in honor of National Artist for Visual Arts and Dean of Illustrators Francisco V. Coching. As part of the first segment called CCP Café, the family will give an intimate portrait of Coching as father, uncle and lolo. Amassing more than five million views on Facebook in their radio broadcast, Eastern Samar National Comprehensive High School students will read Lapu-lapu, one of Coching works, in a dramatic fashion in front of a live audience. Pinoy Reads Pinoy Books Book Club will lead a book discussion about Coching’s El Indio. At 12:00 noon, Tadhana, a spoken word group, will lead a set of literary performances by women spoken word artists. Noted komiks artists such as Randy Valiente will give tribute to Coching through workshop, talks and art activities. Performatura visitors may view the ongoing Coching Birth Centennial Exhibit entitled Nasaan ka na, Mara-bini? curated by Alice Sarmiento. The last day of the festival is in honor of the National Artist for Literature Edith Tiempo in commemoration of her birth centennial. Fictionists and poets who were influenced by Tiempo will be having a tribute performance to their beloved mentor through poetry reading and talks. Dumaguete’s Kahayag Dance Company will perform Tiempo’s Bonsai. Featuring Tiempo’s life and works, an interactive centennial exhibit curated by Prof. DM Reyes and Gwen Bautista will also be launched. Performance literature experts Chris Mooney of Singapore and Azam Rais of Malaysia will perform and facilitate a workshop. CCP partnered with the Book Development Association of the Philippines for the three-day Aklatan All Filipino Book Fair.